REUNITED!! 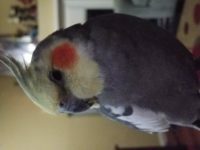 Dusky is about 2 year old cockatiel. Gray body and yellowish head. He does whistle few sounds.. If you found please contact me. There will be $150 reward for safe return of him.